And you thought "Paste Pot Pete" was a terrible villain name. This is the Iverson they’re talking about…how could Parade-Hater-Horace hate a parade comprised of these fine pieces of modern engineering? 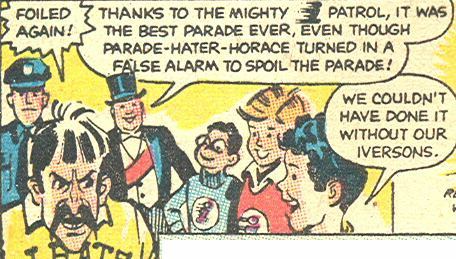 EDIT: Just been informed that the weblog Comics Make No Sense addressed the Parade-Hater-Horace situation just recently. You know, I swear I Googled it before I posted. Ah, well. Andrew Weiss has unleashed another installment of “Growing Up 2600” – his ongoing series about the classic and not-so-classic games of the Atari 2600 video game system. I’m proud to say this particular installment was inspired by yours truly, so I invite you to go check it out and find out just how cheap I can be. FOLLOW-UP to the story of the mystery certificates/coins/dolls from last week: turns out these girls were somehow offended by Employee Timmy when he did not invite them to his birthday party, and thus formed the Anti-Timmy Force 4 (hence the ATF4), dedicated to…making out certificates for the store and, um, dropping coins outside our door, and…basically, having no impact on Timmy at all, since I’m the person cleaning all this up. Or, to sum all that up more succinctly: high schoolers. So there you go. DC is offering Flash and Green Lantern rings to tie into the Brightest Day promotion connected to Flash #1 and Green Lantern #53. Seems odd to me that another green ring is being offered so shortly after the last one, and a small part of me (probably the pinkie toe) thinks that we’re in fact getting a white ring in this promotion, and it’s simply being advertised as a green ring for the time being to avoid spoilers for future issues of Blackest Night . If so, there would still be plenty of time for DC to go “hey, it’s actually a white ring” and for retailers to adjust their final orders, after the point when spoilers are no longer a worry. Of course, this all assumes there’s going to be a white ring to begin with, which may be sorta kinda implied by some of the Brightest Day ad art. But just so we’re clear…I’m fully aware this is likely just a bunch of crazy talk on my part. …This is what I think about instead of important things. 1. Jim Kingman writes a brief history and appreciation of Swamp Thing supporting character The Patchwork Man. 2. Comic book-themed wedding centerpieces…including a couple of…well, guess who. 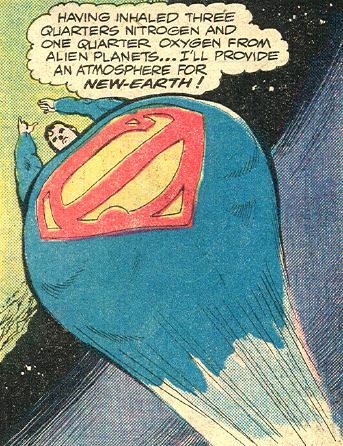 Not magically altered, not under the influence of Red Kryptonite…Superman here is revealing the superpower of being able to balloon up to enormous site after inhaling, well, in this case, a sizable amount of human-breathable atmosphere. 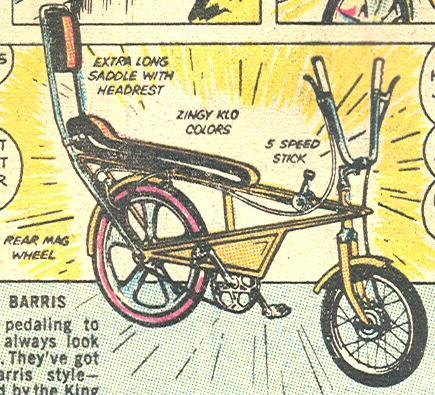 Oh, Bob Haney, you nutty guy!